Did you know that you can use 3DMark for more than just benchmarking? Over two-thirds of users turn to 3DMark to check the stability of their overclocks. And more than half use it to test system cooling performance. 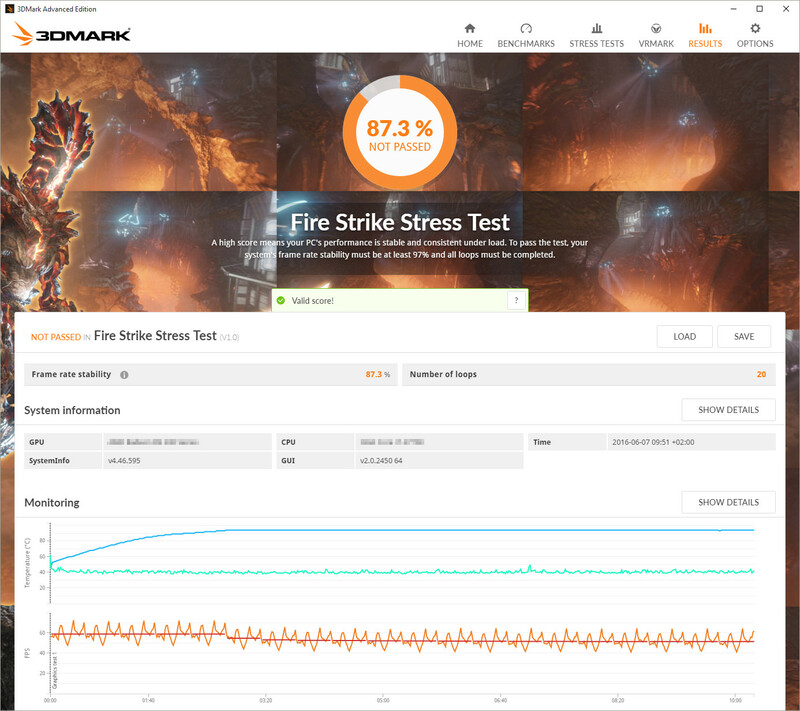 Now we've made it easier than ever to check the stability of your PC by adding a dedicated stress testing feature to 3DMark. The aim of stress testing is to place a high load on your system for an extended period of time to expose any problems with stability and reliability. It can also help identify faulty hardware or the need for better cooling. The best time to run a 3DMark Stress Test is after buying or building a new PC, upgrading your graphics card, or overclocking your GPU. If your GPU crashes or produces visual artifacts during the test, it may indicate a reliability or stability problem. If it overheats and shuts down, you may need more cooling in your computer. 3DMark now includes four levels of stress testing based on the Sky Diver, Fire Strike, Fire Strike Extreme, and Fire Strike Ultra benchmarks. Each 3DMark Stress Test runs in a loop without pausing for loading screens or other breaks. In 3DMark Advanced Edition, the test loops 20 times and runs for around 10 minutes, which is usually enough to uncover any stability or cooling issues. With 3DMark Professional Edition, you can set any number of loops from 2 to 5,000. After running a 3DMark Stress Test, you will see your system’s Frame Rate Stability score. A high score means your PC's performance under load is stable and consistent. To pass the test, your system must complete all loops with a Frame Rate Stability of at least 97%. For more details, please read our 3DMark Technical Guide. In the example below, you can see that the system failed the test because its average frame rate dropped from 59 FPS to 51 FPS after the GPU reached its peak temperature. 3DMark shows that the system was not able to maintain a consistent level of performance under load. It had throttled down its performance when hot, suggesting that better cooling may be needed. Stress Tests are available now in 3DMark Advanced Edition and 3DMark Professional Edition. Standalone versions will prompt you to download and install the update. On Steam, 3DMark updates automatically.